The Falcon was the first operational guided air-to-air missile of the U.S. Air Force. Development started in 1946, when Hughes was awarded a contract to study a subsonic short-range air-to-air missile under project MX-798. The requirement was soon changed to a supersonic missile, to be launched from bombers for self-defense, and development continued under project MX-904 in 1947. At this time, the missile designator AAM-A-2 was also assigned. The first experimental XAAM-A-2 missiles were tested in 1949, and in 1950, the missile's platform was changed from bombers to fighters. Now named Falcon, the AAM-A-2 was to become a missile for use by fighter interceptors (F-89, F-102) against relatively slow flying bombers. In 1951, the USAF began to assign aircraft type designations to its guided missiles, and interceptor missiles were designated as "Fighters". The Falcon became the F-98. The initial XF-98 was designed for use by subsonic interceptors (like e.g. the F-89), and because of the burn characteristics of its rocket motor wasn't capable of launch from supersonic aircraft. Development of the XF-98 was eventually dropped in favour of a supersonic-launch variant, which was briefly designated XF-104 before it became the XF-98A. The XF-98A prototypes were ground-launched aerodynamic and propulsion test vehicles, while the YF-98A test missiles were generally air-launched and incorporated a guidance system. After several years of testing, the first production-representative F-98A was eventually delivered in 1954. In 1955, the USAF stopped using aircraft designations for missiles, and the Falcon was again redesignated. The XF-98A, YF-98A, and F-98A became the XGAR-1, YGAR-1, and GAR-1, respectively. The GAR-1 was a semi-active radar homing short-range (8 km / 5 miles) intercept missile. It had a Thiokol M58 solid-fuel rocket motor and a rather small 3.4 kg (7.6 lb) high-explosive warhead. It didn't feature a proximity fuze, so the missile had to hit its target to explode. This was not considered a problem for the intended use against large and slow bombers. The GAR-1 became operational with F-89H/J and F-102A interceptors in 1956, and about 4000 GAR-1's were produced. The XGAR-1A was a variant of the GAR-1 with a slightly larger airframe and improved motor, and was eventually developed as the GAR-3. The XGAR-1B used the same airfrane as the GAR-1, but was infra-red guided. This version was redesignated as GAR-2. The GAR-1C was a projected variant using the airframe of the -1A and the infrared guidance of the -1B. As such, it was the same concept as the later GAR-4. The GAR-1D was an improved GAR-1, which had better manoeuverability because of much larger control surfaces, fitted separately from the wing behind the trailing edge. Its speed was also slightly higher that that of the GAR-1. The GAR-1D was the main production model of the original SARH Falcon, with about 12000 missiles built. The GAR-2 was very similar to the GAR-1D, but used infrared homing instead of SARH, which had the obvious advantage of making the GAR-2 a "fire-and-forget" missile. Like the GAR-1, it became operational in 1956. Normally, interceptor aircraft were equipped with both types of missile, and it was not unusual for a pilot to fire one missile of each variant on a two-missile salvo, to increase the chances of a kill should one guidance method fail. The GAR-2A variant had an improved IR seeker which could lock on targets in a wider range of background temperatures. More than 26000 rounds of the GAR-2/2A were built. The GAR-2B was the final development of the infrared Falcon, and is discussed below under its later designation of AIM-4D. In 1958, Hughes introduced an improved Falcon derivative, initially called the Super Falcon. The first Super Falcon to be developed was the SARH version, designated GAR-3. It had a longer-burning solid-fuel rocket motor for increased range and higher performance, and a slightly larger airframe with wing-root strakes. The HE warhead was also more powerful, but available sources provide widely differing weight data (between 3.9 kg (8.6 lb) and 13 kg (29 lb)). After only 300 GAR-3's had been built, it was superseded in 1959 by the GAR-3A. The GAR-3A had a new dual-thrust (boost/sustain) M46 rocket motor, and improved SARH guidance with increased accuracy and higher ECM resistance. About 3400 GAR-3A's were produced, and replaced the GAR-1D on most platforms. The XGAR-4 was the IR homing equivalent of the GAR-3 Super Falcon. It was not built, however, and all IR Super Falcons were produced as GAR-4A, with the same dual-thrust motor as the GAR-3A. Compared to the GAR-2/2A, the GAR-4A had an improved IR seeker, which enabled it to lock-on to smaller targets at greater distance. GAR-4A became operational in 1959/60, and about 2700 missiles were built. 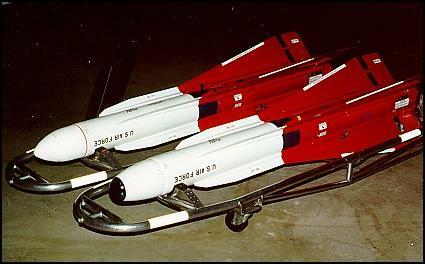 The GAR-4A replaced all earlier GAR-2/2A missiles. The XGAR-5 and XGAR-6 were projected nuclear-armed Falcon derivatives, which are briefly discussed in the chapter about the GAR-11/AIM-26 Falcon. The assignment of the plain AIM-4 designator (without suffix letter) to the GAR-1 did not conform to the regulation, which clearly required suffix letters for all variants. I have no explanation why this was done, especially because the new suffix letters didn't match the old ones anyway. The AIM-4D, already briefly mentioned above as GAR-2B, was the final operational development of the AIM-4 Falcon. It combined the smaller airframe of the GAR-2A/AIM-4C with the more modern IR seeker of the GAR-4A/AIM-4G, and was the only Falcon missile designed for use against fighters. 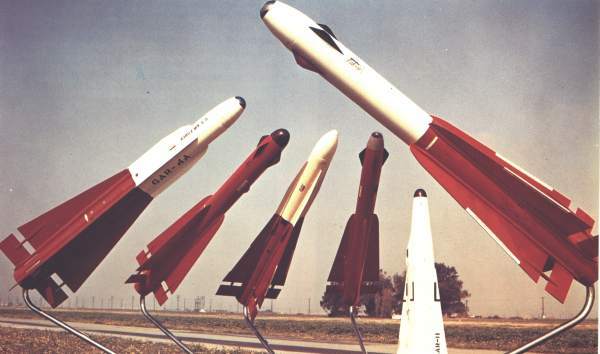 About 4000 AIM-4D's were produced, and it became operational in 1963. Many earlier AIM-4A/C rounds were also converted to AIM-4D standard. The AIM-4D was used in combat in South-East Asia by some F-4D Phantoms, which were equipped with special LAU-42/A launchers for this purpose. However, it became soon apparent that the AIM-4D was ill-suited for the close-range dogfights encountered over Vietnam, and only 5 kills were achieved with the Falcon. The main problem of the missile was seeker cooling. The limited amount of on-board coolant meant that the seeker could not be pre-cooled for any length of time, which in turn meant that it had to be cooled more or less shortly before firing, i.e. when close-range combat had already started. This cooling, however, took up to 5 seconds which is like eternity in a dogfight, so that most targets were out of reach again when the missile was finally ready. Moreover, when the coolant was exhausted after several aborted launches, the Falcon was just useless dead weight, which had to be brought back to base for servicing. Another problem of the Falcon was the lack of a proximity fuze, which made it effectively a hit-to-kill missile. Part of the blame for the abysmal combat record of the AIM-4D has been given to the fighter pilots, who did not make good use of the Falcon's relatively long lock-on range (9.6 km / 6 miles), which would have made BVR kills possible. However, this blame is somewhat unjustified, because combat rules required visual identification of essentially every potential target before engagement, making the deployment of the Falcon in Vietnam questionable at best. The AIM-4D was gradually withdrawn from use beginning in 1969, and by 1973, the AIM-4D was no longer operational with the USAF. The final variant of the Falcon was the experimental XAIM-4H, of which only 25 were built in 1970/71. It was an improved AIM-4D with an active laser proximity fuze, a new warhead, and enhanced manoeuverability. The proximity fuze consisted of 4 laser beams in the nose, perpendicular to the missile axis, which effectively created a disc-shaped detection zone around the missile nose. However, because of the Falcon's general problems, and because the AIM-9 Sidewinder proved to be an increasingly successful and versatile IR homing missile, the AIM-4H project was aborted in 1971. The final Falcons in USAF service were the AIM-4F/G's used by the F-106A interceptors. When the latter was phased out in the 1980's, the Falcon ceased to be part of the USAF inventory. Other Falcon variants and developments are the GAR-11/AIM-26, GAR-9/AIM-47, and AGM-76 Falcon missiles.